A detailed review of the beginner yoyo, the YoYoFactory Fast 201 Yoyo. Fast 201 Yoyo Review YoYoFactory Yoyo TrickThis yoyo is the Fast 201 by Yoyo Factory, and we are happy to recommend this yoyo for beginners, and we even give it a Super Fly rating, because it is super durable, which is great for beginners; it requires almost no maintenance, which is pretty amazing for a ball bearing yoyo, we will talk about that; and it actually does a whole lot of different tricks really easily once you know how this yoyo works, and just a couple of tips which we will give you in this video. 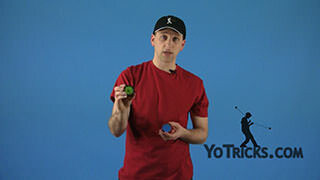 Let’s take a look at it and see what makes this yoyo so great for beginners. The reason the Fast 201 is so good for beginners is because it’s got kind of like training wheels built into it which make the most basic, basic yoyo tricks – which can be challenging to learn at first – its got some training wheels to make those easier, but those training wheels do not actually stop you from advancing and learning all sorts of more challenging tricks. By training wheels what I am talking about is the starburst technology that they have built into it. We will show you that in our Take Apart portion of the video, On the most fundamental level, what it allows you to do is it allows you to just wind the yoyo, just like this, which most ball bearing yoyos won’t allow you to do. You will just keep spinning the yoyo around and around until you find some other technique to get the string to wrap around. So, it is easier for that. It is also easier for doing your fast wind. It is responsive when you play with it, consistently responsive, usually another yoyo would need lube or something, but the Fast 201 doesn’t, which is pretty awesome. Despite the training wheels, and how aggressive those starbursts are on the string, it still sleeps for like 30-45 seconds, which is pretty good for a yoyo like this. 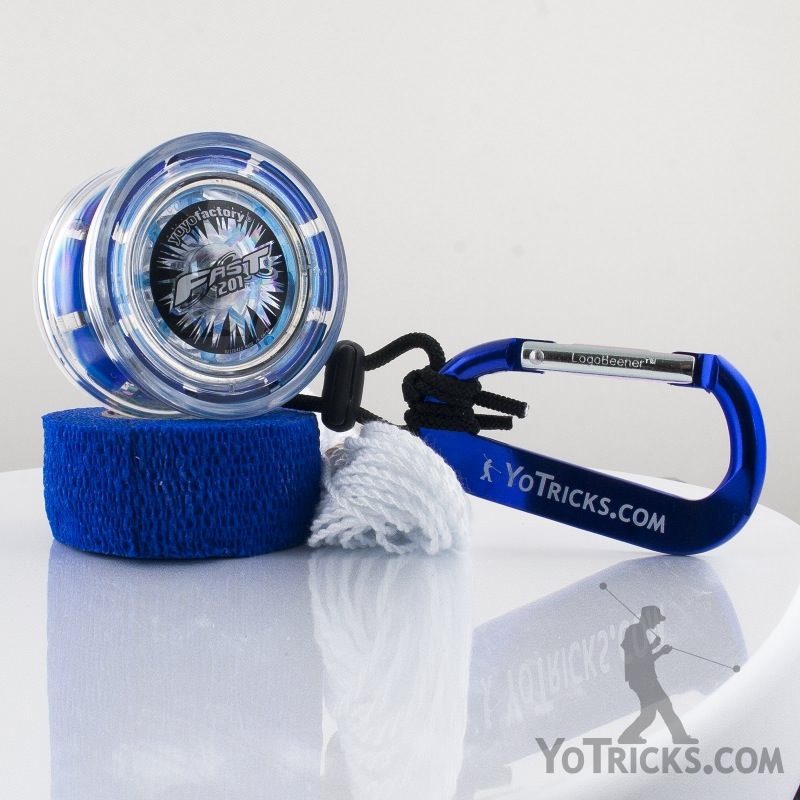 Combine that with the durability, it just has everything that a beginner would want out of a yoyo, and it is really not too expensive, so it is a pretty good way to get into yoyoing, it can take you pretty far. 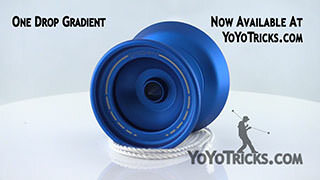 It can’t take you all the way to the most advanced tricks, but that is not what this yoyo is for. So lets take it apart and see why it is such a great yoyo for beginners, and what YoYoFactory has done to make this yoyo what it is. As you take apart the Fast 201, you have got a few different pieces in here, you want to make sure that you always keep track of those. You can see, on this end there is an O-ring, there is an O-ring on the other side too. You have got this spacer here, you have got the bearing, and another spacer on the other side. You can see how those are sticking together. 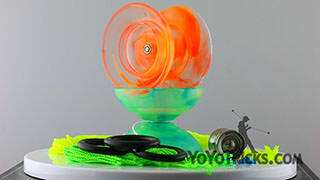 One thing is that the pieces in this yoyo fit together really well, and so a lot of times they will just stick together and they will not come out of the yoyo, which is good if you are yoyoing and the yoyo comes apart, you don’t want to lose anything. One thing you will notice about the spacer is that one end fits inside the bearing itself, the other side is flat. Obviously when you are putting the yoyo together you want to put the flat end in against the yoyo and then put the bearing on top of it, along with the other spacer on top. It is a pretty sensible way, it goes together pretty easy. If you look at the yoyo half itself, you can see there is the clear plastic, and it has this red plastic on the inside, because this is a red one. You can see all these spokes coming out and then these spokes actually poke through the yoyo into these starbursts right here. 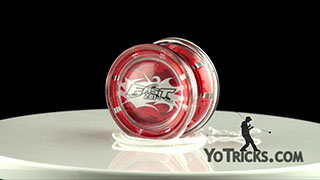 You can actually touch the red plastic and if you push on it, it goes down into the yoyo. This is what makes the yoyo unique, this is what makes it work. These are kind of the training wheels I was talking about. As the yoyo spins the string is going to touch up against these, it makes a little bit of noise, it will push those into the yoyo to allow it to sleep for a long time, but when you pull it back up those things are going to be pretty aggressive, they are going to grab the string and make the yoyo respond really quickly, really easily, which makes the yoyo so easy to wind up; what makes it so easy to learn all your basics; what makes it responsive. 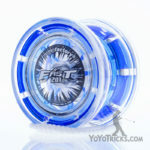 It is a pretty ingenious design because it uses a ball bearing system which gets you a lot of sleep, but it has this very aggressive response that doesn’t slow the yoyo down too much, but gives the yoyo the kind of response that you need. 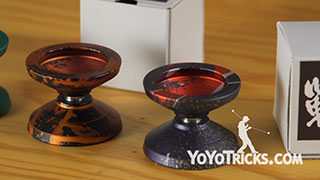 It has struck a pretty impressive balance, which is really what makes the yoyo what it is. That is why they have named it after that, the Fast in Fast 201 is Fully Active Starburst Technology, which is really a mouthful, but they are just pointing out that is what those starbursts are, inside they are active. 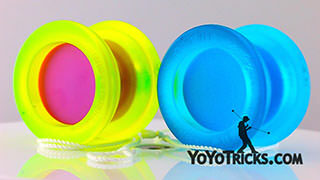 If you look at the yoyo itself, one thing you will notice on the packaging of the yoyo, they are going to tell you that you can either line up the starbursts on the yoyo like this, or you can offset them a little bit. If you line them up then that is going to make the yoyo a little easier to wind the string, it is going to make it a little more responsive. 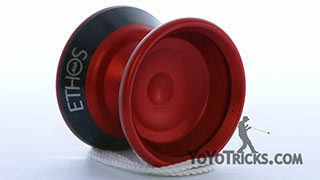 If you offset them it is going to make the yoyo a little less responsive, maybe a little better for String Tricks. That’s true for the most part. What I have found is if you just tighten the yoyo down, get it nice and snug, you don’t really need to crank on it, just get it so it is not easily tightening anymore, it is going to wind up pretty easily when you do that. If you loosen the yoyo up just a little bit, that will make it better for String Tricks, that will make it a little bit less responsive if you want to work on some other tricks. We will talk about those in the trick portion of this video. 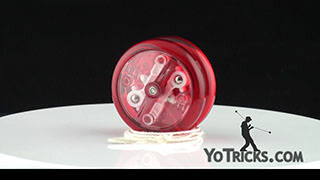 That is what the starbursts are all about and that is what makes this yoyo work. So that is the Fast 201 taken apart. 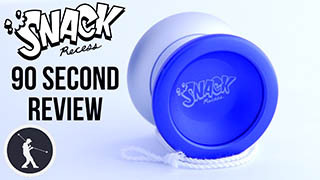 As we have already noted, one of the great things about the Fast 201 is that these aggressive starbursts, they grab the string so well that it makes tricks like learning how to wind the yoyo quickly and stuff like that, it makes it a lot easier. Also, because it is a ball bearing yoyo, it will sleep long enough to give you plenty of time to do all your different Picture Tricks. 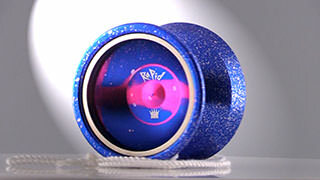 That is just another thing that will help you progress, it will help you get better at your throw, and things like that. 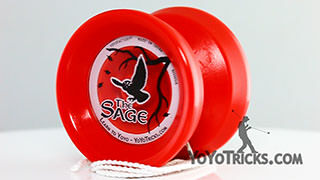 If you have the yoyo all the way tightened down, and you try to land it on the string, you are going to get a lot of feedback from the yoyo, it is going to vibrate quite a bit. So if you want to do String Tricks all you have to do is just loosen the gap just a little bit, you should be able to get it right on the string, and then it will play on the string pretty great. It can make a little bit of noise, or even a lot of noise, while you are doing that. 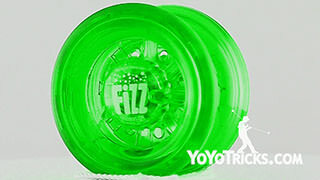 Some kids may even find that kind of fun, kind of cool, because it lets everybody around know that they are yoyoing. The nice thing is that it does not interfere with play. 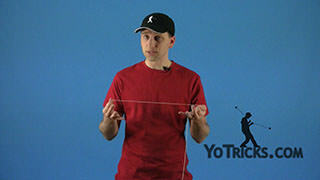 You can learn all of your Basic String Tricks with this yoyo. 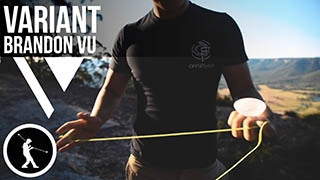 One thing that you will find is that when you want to get into more Advanced String Tricks, if you try to bind the yoyo, sometimes the yoyo will get into a knot, especially if the yoyo is tightened down really well, and the same thing applies to Binding as it does to String Tricks. When you try to get it on the string if the yoyo knots up on you when you are starting to do your Bind, all that means is that the yoyo is tightened down too much, and what you can do to deal with that is you can just loosen the yoyo up a little bit. Then you can even use this yoyo to learn how to bind, which again, I think is pretty amazing considering how aggressive those starbursts are. You can actually use it for that. 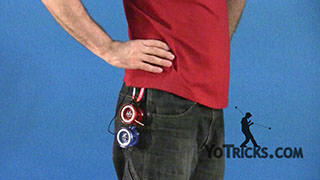 Once you have learned to bind you will be ready to graduate to a more advanced yoyo, an unresponsive 1A yoyo, and most unresponsive 1A yoyos will be able to take you all the way to the most advanced tricks. 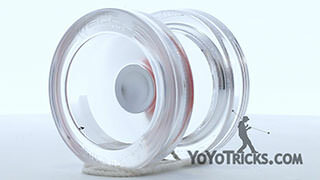 Again, it is pretty impressive that one yoyo can take you all the way from being an absolute beginner, up until to almost being able to do advanced String Tricks. 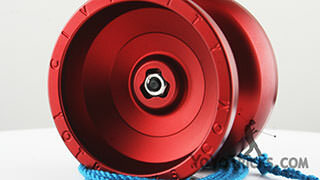 That is what the Fast 201 is capable of, and that is why we think it is just a great yoyo to get you started. 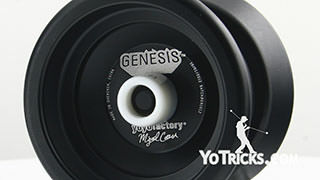 One thing that we have mentioned about this yoyo is that it does not require a whole lot of maintenance, which for a beginner is nice because you would rather focus on learning your tricks instead of maintaining your yoyo. 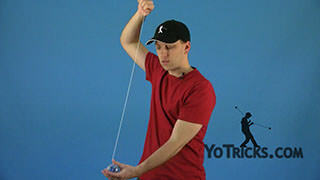 I’ll show you how to put the string on, and this is just the most conventional way to put a string on most any yoyo. Most yoyos work like this, I mean. You are just going to take your string and split it apart at the bottom, and open the loop up. Like I said, just like any other yoyo you are just going to put it on one time and pull the string back and allow it to twist around and that is pretty much all you need to know about stringing the Fast 201. Because the response system is so aggressive, it actually doesn’t matter a whole lot what kind of string you use. If there is a certain color that you like, I recommend you just get that color whether it is polyester or 50%/50% or whatever, it just doesn’t matter. If you prefer white string, just get any kind of white string. 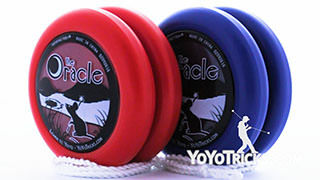 If you get a 50/50 blend, or 100% polyester it is going to last a lot longer than cotton string, but for the most part all strings play pretty similarly on this yoyo. We did say that you don’t really need to lube the bearing. 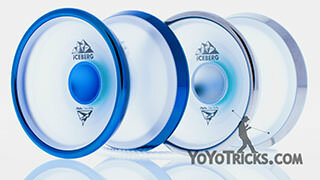 That is because you usually lube the bearing to make it more responsive, when it comes to a responsive yoyo. One thing that you can do, if you want to, is you can just get some thin lube if you want the bearing to last longer. You can just open the yoyo up. A lot of times what we will recommend is that you actually lube the axle, so that would be lubing it right here, in order to make the yoyo more responsive. Actually with this yoyo you do not need to do that because the response system is aggressive enough. What you would do in this case is if you want the bearing to last longer is you just put a tiny drip, one or two drips on the bearing itself, it won’t really take a whole lot. 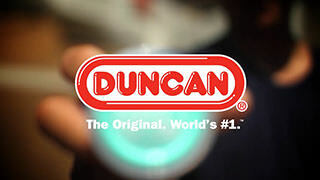 Again, you can use thin lube because the yoyo is responsive enough, you don’t need a thicker lube slowing your bearing down and making it like that. That is really all you need. Once you get that you just put the string on, like I said it doesn’t really matter what kind of string you get, and you are pretty much ready to go. It should just continue to work and work until you are ready to move on to a different yoyo. 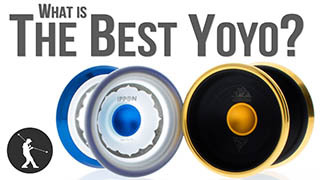 I am sure you can see by now why we are so happy to recommend the Fast 201 to people just getting into yoyoing. The fact that it does not need a lot of maintenance, so there are not a lot of things to think about besides learning the tricks, which is pretty great. 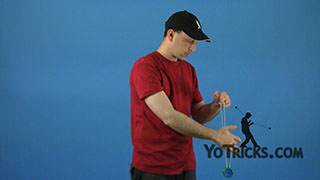 It is very responsive, so it is going to be easy to just throw the yoyo down and get it to come back up. 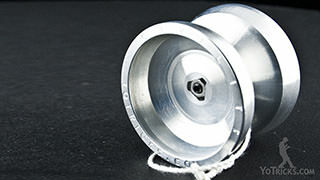 It is durable, so if you are going to be hitting the ground a lot which a lot of beginners do, you don’t have to be worried about it breaking as quickly as some other yoyos may break. And, frankly, it just plays great. It does all sorts of different kinds of tricks, and it does them well. 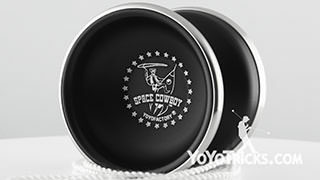 Again, if you are just getting started, or if you want to get a yoyo for somebody who is probably over 8, maybe 10, who you really think will be into yoyoing, this is a great place to get started. 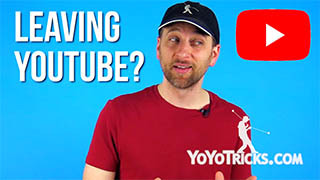 Of course you can use all of our videos to learn all of those beginner tricks and all the way up to more advanced tricks. 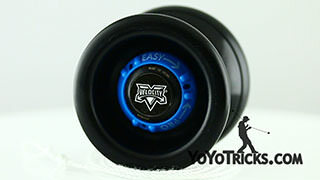 We are happy to recommend to you the Fast 201 by YoYoFactory.